The first new deep coal mine in the UK for decades has moved a step closer after councillors unanimously backed the plans. The West Cumbria Mining Company wants to mine next to the site of the former colliery in Whitehaven that shut three decades ago. The Woodhouse Colliery could create 500 jobs, but objectors have said mining will contribute to global warming. I am not normally a friend or supporter of coal, but there might be a different agenda behind this mine. The coal that will be mined at Woodchurch Mine, will not be burnt in a power station or steam engine, as it is being mined for a different purpose. It is high-quality metallurgical coal, Wikipedia says this about metallurgical coal. Currently, there is a shortage of this product and Europe import several million tonnes a year. It also appears that the Cumbrian metallurgical coal is of a high quality and low in impurities. In Wikipedia, there is an entry for the HIsarna ironmaking process. This process is being developed by the Ultra-Low Carbon Dioxide Steelmaking (ULCOS) consortium, which includes Tata Steel and the Rio Tinto Group. Reduction in carbon-dioxide produced by the process compared to traditional steel-making are claimed to be as high as fifty percent. This figure does not include carbon-capture to reduce the carbon-dioxide still further. However, looking at descriptions of the process, I feel that applying carbon-capture to the HIsarna steelmaking process might be a lot easier, than with traditional steelmaking. If you are producing high quality steel by a process like HIsarna, you want to make sure that you don’t add any impurities from the coal, so you have a premium product. So is Cumbrian metallurgical coal important to the HIsarna process? I obviously don’t know and it is not even certain that HIsarna will eventually become a mainstream way of producing high-quality steel. But you can be assured that there are other companies trying to find the Holy Grail of producing high quality steel with low impurities and without creating masses of carbon-dioxide. The company or organisation, who cracks this one will make a fortune ethically, as we’ll always need lots of high quality steel. Mining coal in Cumbria may seem a retrograde step, but it could be central to cutting carbon-dioxide emissions in high-quality steel-making. I’ll be watching this development with interest. The title of this post is the same as that of an article in Issue 874 of Rail Magazine. When I saw this article, I thought it was rather surprising, as coal is rather the arch-demon to environmentalists. But this is not about coal for producing electricity, but metallurgical coal, that will be used in steelmaking. West Cumbria Mining are proposing the mine and ofn their web site, the following is said. 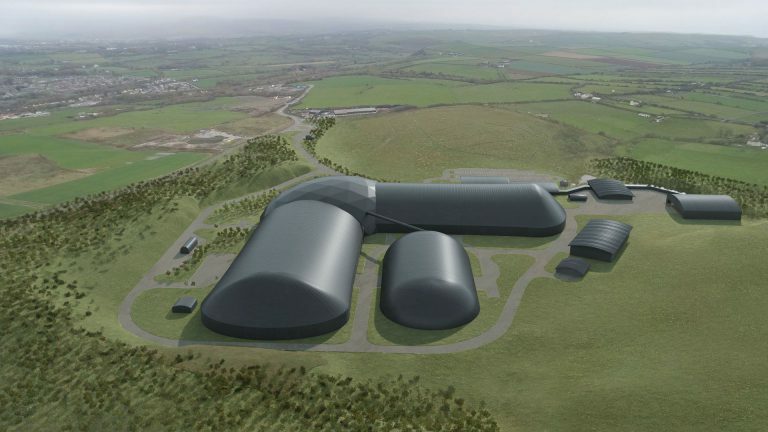 West Cumbria Mining is investing in developing plans for the creation of a metallurgical coal mine off the coast near Whitehaven in West Cumbria to supply the UK and European steel-making coal market, which currently imports around 45 million tonnes per annum. I would assume the 45 million tonnes refers to the total of the UK and European markets. S there is certainly a large market to supply, if the price is right. This extract describes how the mine will be created. Woodhouse Colliery would be created using the access tunnels to old anhydrite workings at the former Sandwith Drift Mine, on the edge of Whitehaven. Until 2004, the site was occupied by the Marchon chemical works. Studies have determined that sufficient coal reserves could be accessed to sustain mining operations for at least 50 years. This picture was taken from their web site. It doesn’t look to be a stereotypical coal mine. Much of the coal would appear to be mined offshore. This extract talks about the use of the Cumbrian Coast Line, that passes through Whitehaven. One of the things that actually makes the project realistic and viable is that we have access to existing infrastructure. There are lots of projects where actually the biggest capital cost is the infrastructure required. We have to remove everything by rail – one: because of the volume of material; but two: we wouldn’t be able to get planning if it was a road solution. An agreement has been reached with Freightliner to transport the coal to Redcar. With the mine in full production, six trains per day would operate Monday-Friday. More details about the rail transport are also given. There would be a single-track siding for loading. The siding would be connected to the mine by a 1.4 mile coal conveyor. Everything is covered, so there no dust and gas. The loading will be in an acoustically-closed building. Trains will have 23 wagons. Class 66 or Class 70 locomotives will be used. It does appear that they are designing most things to a high standard. These days, if planning permission with conditions is given, the conditions are usually adhered to, as sanctions are now easier to apply through the Courts. I do have a few thoughts. There would not be much electrification on the route, except for on the East Coast Main Line. The article states that the wagons would be a dedicated fleet for the operation. Surely, they could be designed for fast and quiet operation. I feel that locomotives that meet the latest European regulations should be used. Class 66 locomotives do not, Class 68 locomotives do! I also feel that in the next five years or so, more environmentally-friend;y and quieter locomotives will become available. The article describes how the Cumbrian Coast Line will be improved if the mine gets Planning Permission. If we are going to continue to make and use steel in the UK and Europe, it looks like this mine could create wealth in a part of the UK that needs it, without causing too many negatives. The title of this post is the same as that of this article on the Durham University web site. In January 2016, local residents Alan Gardner, Cllr Kevin Thompson and Lynn Gibson from the Durham Energy Institute at Durham University, met a team of academics to explore the advantages renewable energy and specifically the use of geothermal resources could bring to Spennymoor. And this is the last. Durham University is one of the world leaders in this research field. Spennymoor now has an opportunity to be at the forefront of that research. What the outcomes will eventually be is unknown at this stage but being able to explore the opportunity by the best in the business is encouraging. Charlotte Adams mentioned in the article is the academic, who did the presentation I saw yesterday and talked about in Can Abandoned Mines Heat Our Future?. Everybody, who lives in a mining area, should read this article and show it to everyone they know. The title of this post, is same as that of the title of a public lecture I attended at The Geological Society this afternoon. This page on the Geological Society web site, gives a summary of the lecture and details of the speaker; Charlotte Adams of Durham University. The basic concept is simple. Abandoned coal mines had their pumps turned off when they are closed and the worked areas have flooded with water, that is now at temperatures of around 12 to 20°C. As fifteen billion tonnes of coal have been extracted from UK coalfields, that is a lot of space to flood. An estimate of around two billion cubic metres is given. This means that the water holds somewhere between 27.9 and 46.5 GWH of energy in the form of heat. Heat pumps would be used to upgrade the temperature of this water, to provide hot water at useful temperatures for space heating. For those unfamiliar with the concept of a heat pump, Wikipedia gives a good explanation, of which this is the first paragraph. A heat pump is a device that transfers heat energy from a source of heat to what is called a heat sink. Heat pumps move thermal energy in the opposite direction of spontaneous heat transfer, by absorbing heat from a cold space and releasing it to a warmer one. A heat pump uses a small amount of external power to accomplish the work of transferring energy from the heat source to the heat sink. In connection with this project, the heat source is the warm water in the mines and the heat sink is the water that is circulated to heat the buildings. Wikipedia goes on to say this. In heating mode, heat pumps are three to four times more effective at heating than simple electrical resistance heaters using the same amount of electricity. However, the typical cost of installing a heat pump is also higher than that of a resistance heater. Wikipedia also has a section, which descries the use of heat pumps in district heating. It should also be noted, that as with lots of technology, heat pumps are much improved, from the one I installed in a swimming pool in the 1980s. The electricity to drive the heat pumps could be derived from renewable sources such as hydroelectric, solar, wave or wind. Effectively, the system is using intermittent sources of electricity to create a constant source of heat suitable for space heating. Would The Mines Run Out Of Heat Or Water? As I understand it, the water in the mine will continue to be heated by the heat in the mines. The father of a friend, who came with me to the lecture was a coal miner and my friend confirmed it was hot in a coal mine. The water will of course continue to flood the mine and the water pumped to the surface will probably be returned. So the system will continue to supply heat for space heating. How Long Will The System Supply Heat? The system has the following characteristics. Water is the heat transfer medium. Additives like anti-freeze will probably be applied to the water used for heat transfer. There is no reason the system can’t be designed, so that it supplies heat for many years with regular maintenance and updating. How Does The System Compare To Bunhill 2 Energy Centre? In Bunhill 2 Energy Centre, I described Islington’s Bunhill 2 Energy Centre which uses heat generated in the Northern Line of the London Underground to provide district heating. I am fairly sure that a lot of similar technology will be used in both applications. This page on Wikipedia is entitled London Underground Cooling. There is a section, which is entitled Source Of The Heat, where this is said. The heat in the tunnels is largely generated by the trains, with a small amount coming from station equipment and passengers. Around 79% is absorbed by the tunnels walls, 10% is removed by ventilation and the other 11% remains in the tunnels. Temperatures on the Underground have slowly increased as the clay around the tunnels has warmed up; in the early days of the Underground it was advertised as a place to keep cool on hot days. However, over time the temperature has slowly risen as the heat sink formed by the clay has filled up. When the tunnels were built the clay temperature was around 14ºC; this has now risen to 19–26ºC and air temperatures in the tunnels now reach as high as 30ºC. So one big difference is that the Underground is warmer than the mine and this should make it a better heat source. I feel that engineers on both projects will benefit from the ideas and experience of the others. Would Infrastructure Funds Back This Technology? In the UK, there are several infrastructure funds set up by companies like Aberdeen Standard, Aviva, Gresham House and L & G.
In World’s Largest Wind Farm Attracts Huge Backing From Insurance Giant, I explained why Aviva had invested nearly a billion pounds in wind farms to support pensioners and holders of their insurance policies. Comparing the risk of using abandoned mines to heat buildings and that of offshore wind turbines generating electricity, my engineering knowledge would assign a greater risk to the turbines, providing both were built to the highest possible standards. It’s just the onshore and offshore locations and the vagaries of the weather! I think it is true to say, that infrastructure funds will back anything, where there is an acceptable long-term income to be made, commensurate with the costs and risk involved. But then Government or any public or private company or organisation should not pay over the odds for the energy delivered. Charlotte Adams in her lecture, asked if abandoned mines can heat our future. The answer could well be yes, but there are other sources of heat like the London Underground, that can also be used. I Am Totally Against Brexit, But Read This! York Potash are developing a potash mine in you’ve guessed it! – Yorkshire. This article from the Gazette Live is entitled Work on York Potash mine which could employ 1,000 due to start in September. This can’t be bad news, as every new job on Teesside is needed. This is also said. In the end, I suspect that whether or not we leave Europe, the result will not be a disaster for the country. The dollar will continue to call the shots, as it moves towards being the universal world currency. I have a Google Alert set for “York Potash”, as contrary to the media who are ignoring the story, I believe that the new potash mine at Whitby being developed by York Potash could be economically valuable to the area around Middlesbrough. The Alert found this article on a web site called Engineering and Mining Journal entitled Sirius Minerals Receives Approval For York Potash. The article gives a positive report on the mine. I liked this bit. The project lies between Whitby and Scarborough, extending about 16 km inland from the coast and up to 14 km offshore. According to the company, York potash will be a deep-shaft mine of unprecedented design. Within this area lies the thickest and highest grade polyhalite ore reserve in the world. Development of the 20-million-metric-ton-per-year (mt/y) operation would take place in two phases. The first phase is designed provide 10 million mt/y before scaling up to full capacity over a number of years. That is serious engineering and a hell of a lot of potash. Hopefully, it’ll give an upturn to the workers and residents of Teeside. A quick estimate gives that the full capacity of the mine, is equivalent to about the weight of nine hundred HMS Invincibles, give or take a Harrier or two. This article in the Teeside Gazette is entitled York Potash jobs: How to apply at massive project expected to employ more than 1,000. The first paragraph is. In my book a thousand jobs is good news, so why is only the local paper reporting it? Will The Fight Continue Over Potash On The York Moors? This article on Grough is entitled Campaigners fight on as North York Moors potash mine formally approved. As the mine could employ upwards of a couple of thousand people, have the campaigners sent personal letters to all the redundant steelworkers explaining how it is more important that they are unemployed? I’m sixty-seven this year and all my life, every year or so, I’ve heard reports of the deaths of coal miners. Now today, there are reports of a serious mine disaster in Turkey. When I was in Poland, I shared a train compartment with a lady going to Katowice. I remember the city for a mining disaster in the 1950s, which was nearby. Isn’t it about time, we stopped mining the filthy stuff, as it just creates grief for the miners and their families? And of course there’s always the issue of global warming.